Cute and cuddly aren’t the first words which come to mind when thinking of teethers, but with DingaRings, they most certainly apply! 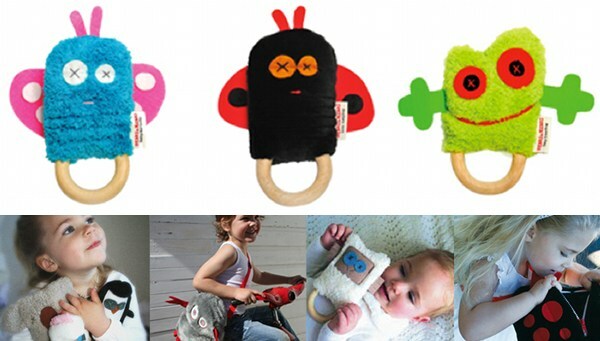 We first told you about them in October 2009 and now there are three new character-filled designs for the next batch of teething babies. Meet (from left) Betty Butterfly, Lulu Ladybug and Tony Tree Frog. Each comes with a list of likes, dislikes and a job description. I didn’t know butterflies could be salsa teachers, but we embrace all types here at Babyology! At $19.95 each, they’re perfect for a newborn gift and even stocking fillers for the upcoming festive season. Urban Baby should have them soon, or buy direct from O.B. Designs.